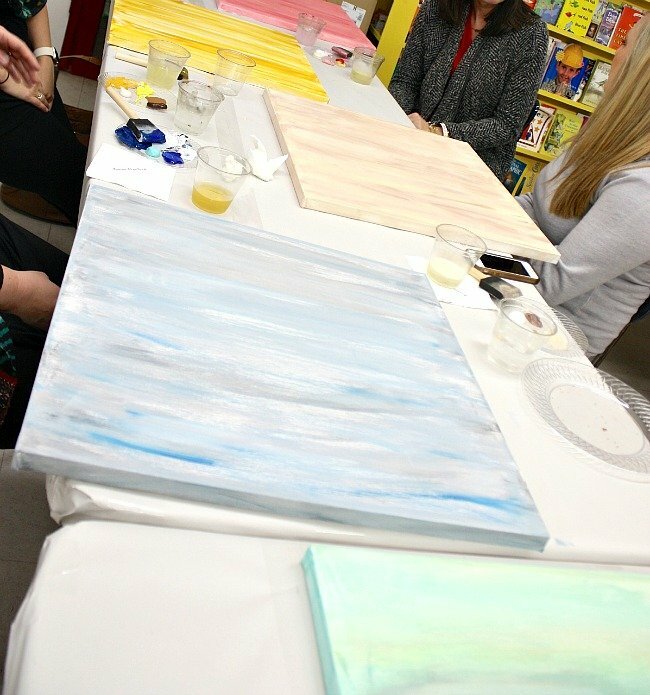 Last week, I hosted a paint party for the Museum of East Texas along with my friends- Emily, Anita and Susan. 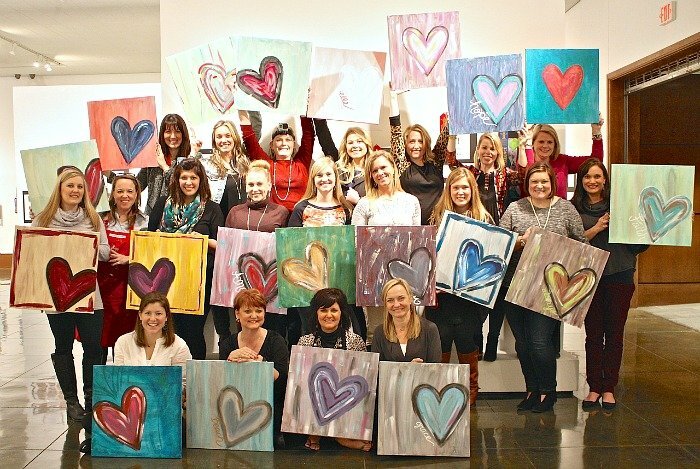 The “Girls Night Out Paint Party”, was an auction item for 20 ladies that we donated in support of a museum fundraiser event this last summer. 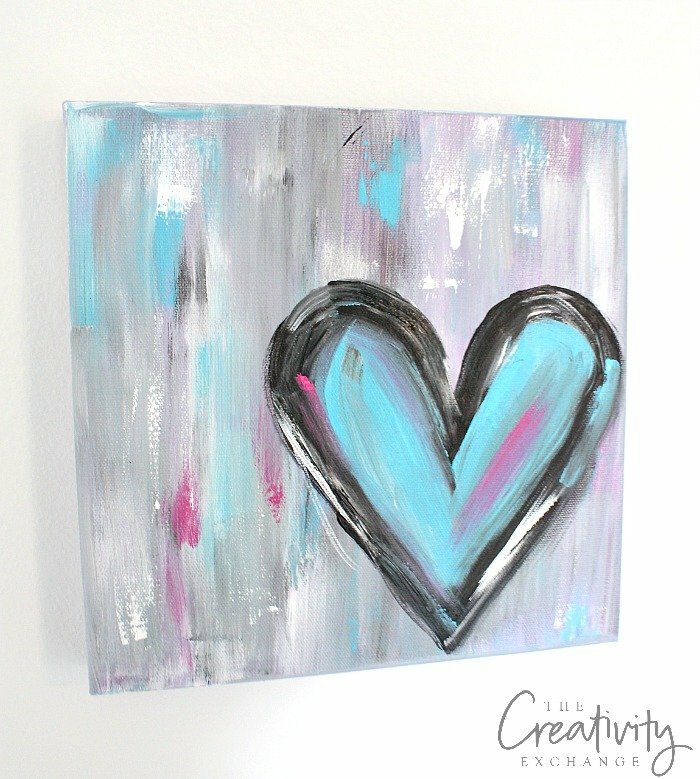 We had such an fun night painting these easy beautiful abstract heart paintings, I wanted to share the tutorial with you guys today (and also share pics of the party). I was seriously blown away by how amazing the paintings turned out! Each of of the ladies really jumped right in, got creative and as you can see, they really did such a great job. 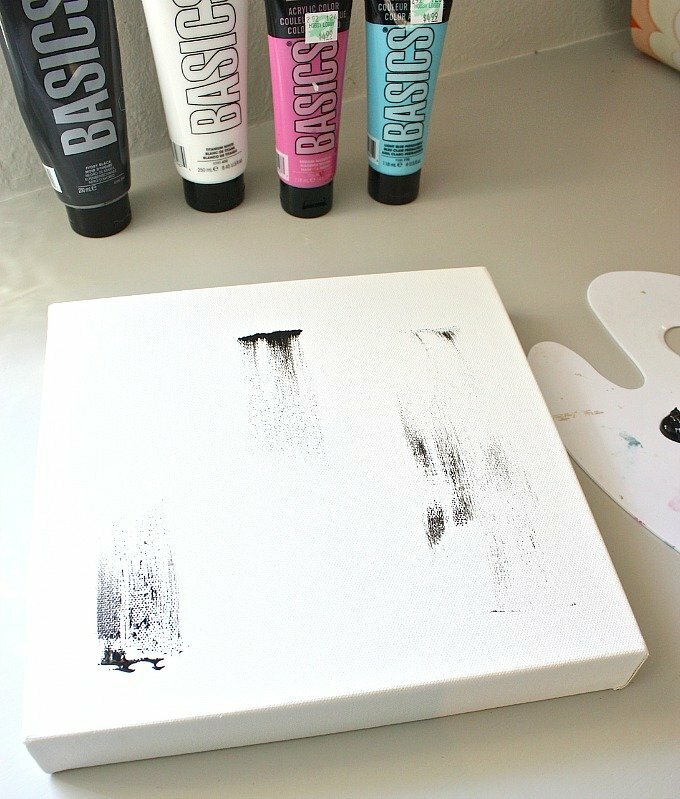 This is a basic acrylic layering technique that could be as abstract or as blended as you would like. Also, keep in mind, you don’t have to do a heart, you could do anything you wanted with this technique. I’m sharing very detailed instructions to walk you through and tons of pictures, so you got this! 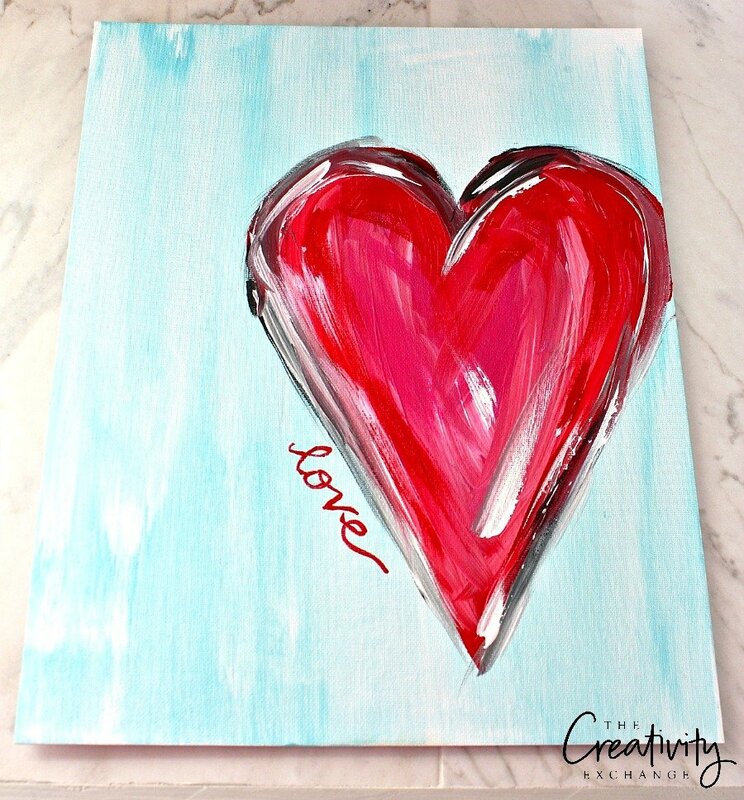 These paintings can be done on any size canvas, canvas board, water color paper or even on a notecard for Valentine’s Day. 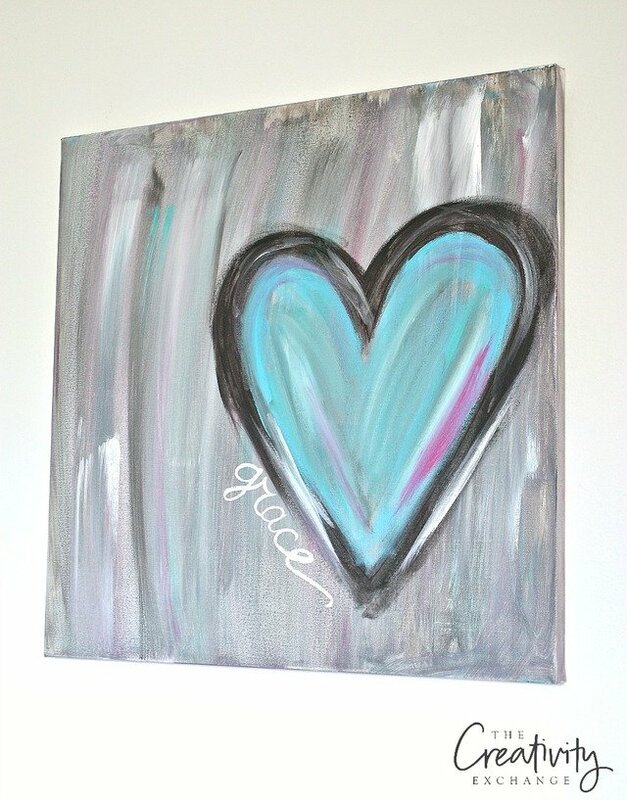 We used a square 20 x 20 canvas for our paint party. You can also see that some of the ladies opted to write a word on the side of the heart like grace, hope, love, etc.. and others decided to leave theirs without any writing. Both look amazing. For my sample board today, I am using a 10 x 10 wide gallery wrapped canvas (this is a great size to slip into a bookshelf). 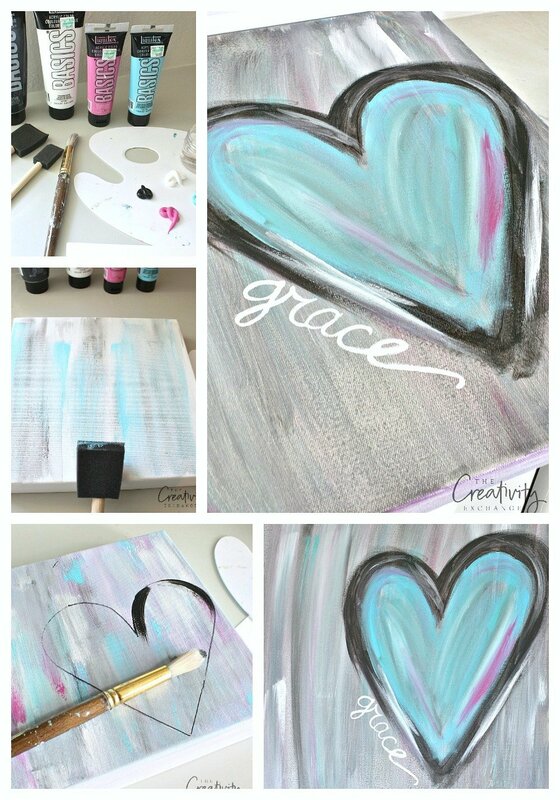 Begin by using your medium size foam brush and put just a little paint on your canvas. If you are using multiple colors, it’s best to go dark to light because you will have a chance later to tweak. 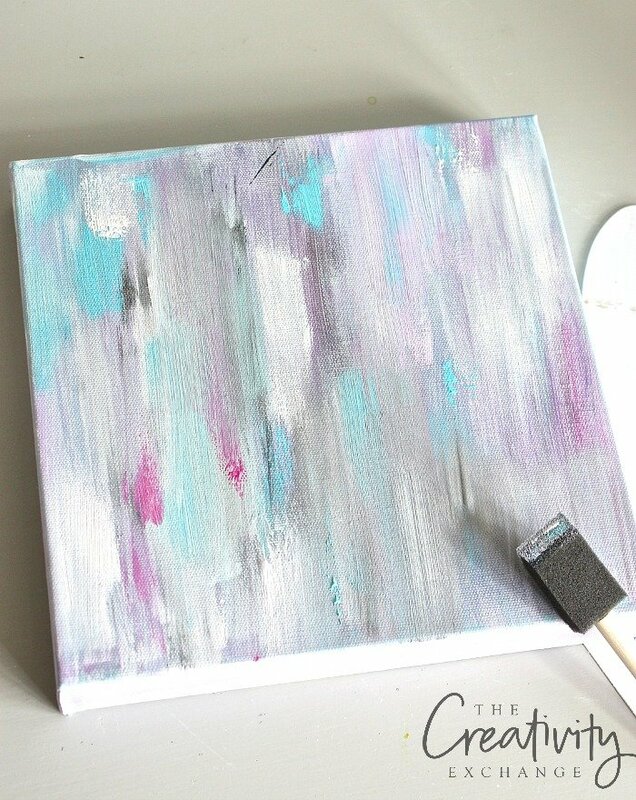 Put just a little paint on the canvas like this below. When you do an acrylic wash, a very small amount of paint goes a long way. The key to your first layer is to get your base wash on the canvas. You don’t really want to blend the color too much because you’ll just end up making a solid new color. 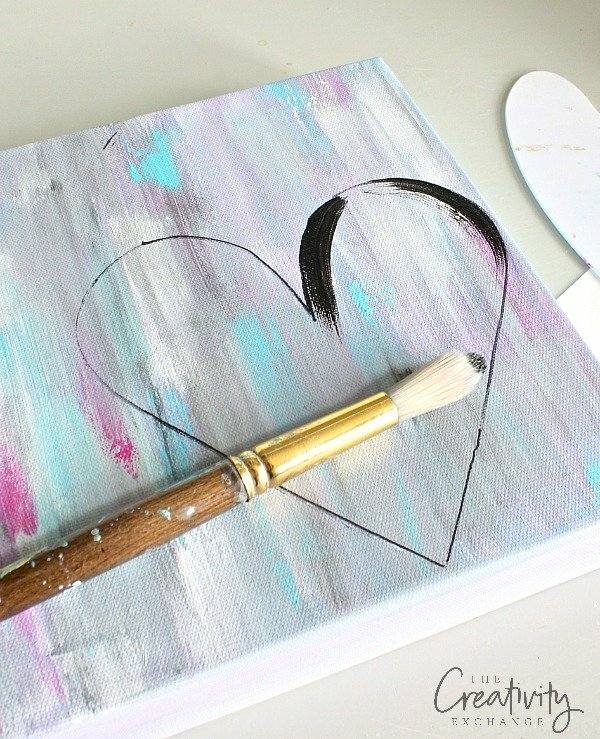 You’ll want to blend it enough to cover wash the canvas but you can still see brush marks. As you can see above, I didn’t really blend the colors too much I just swiped paint on and added a small amount of water for blending. I just brushed went up and down. I also “glopped” (is that even a word?) paint for fun texture. 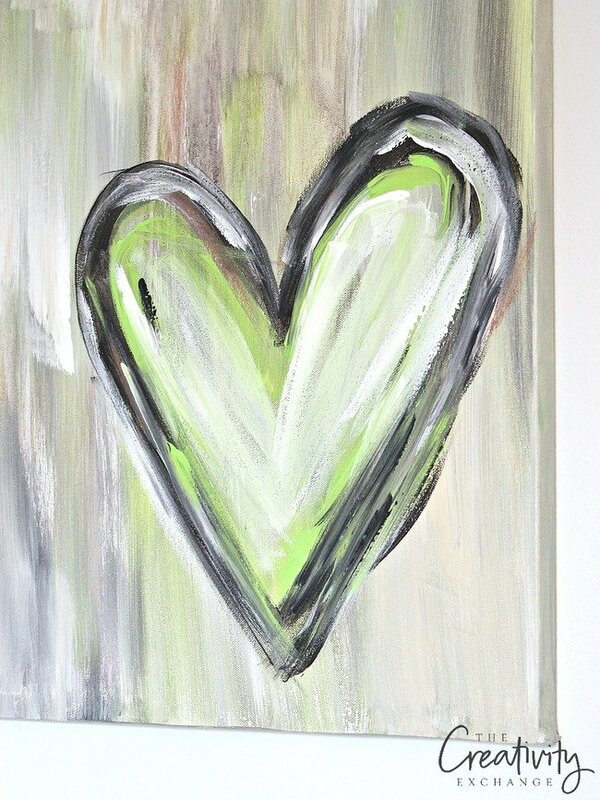 You do this by adding a small amount of paint to the tip of the brush and drag your brush on the canvas. 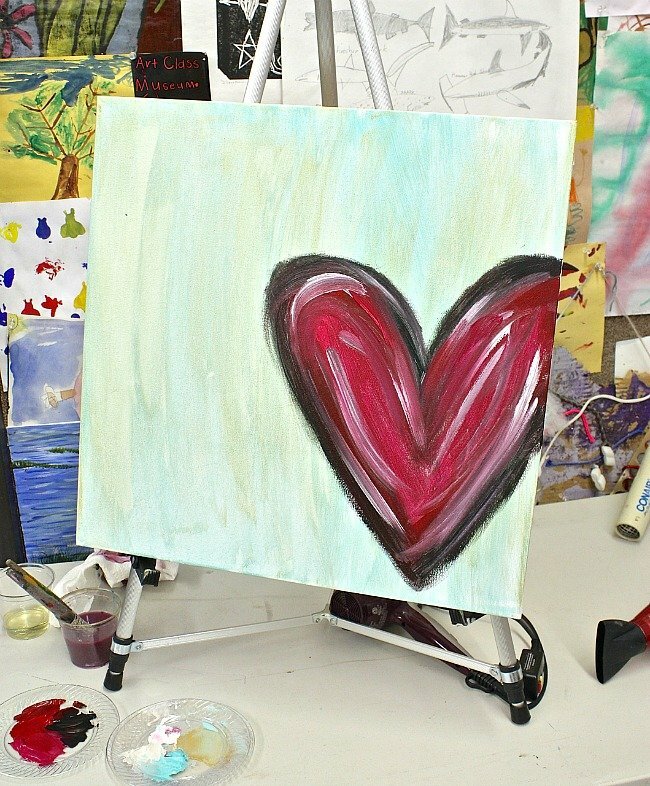 For the second layer, use a hair dryer on cool setting to quickly dry your canvas because it will need to be dry. 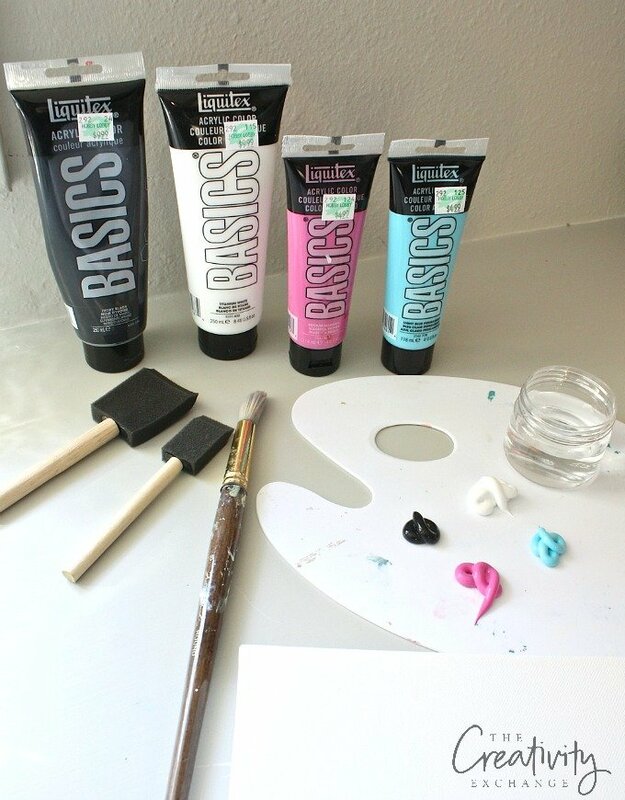 Next, take a good look at your base so far and determine what color you need more of but this time, use your narrow small foam brush by adding swipes of your color (no water this time). 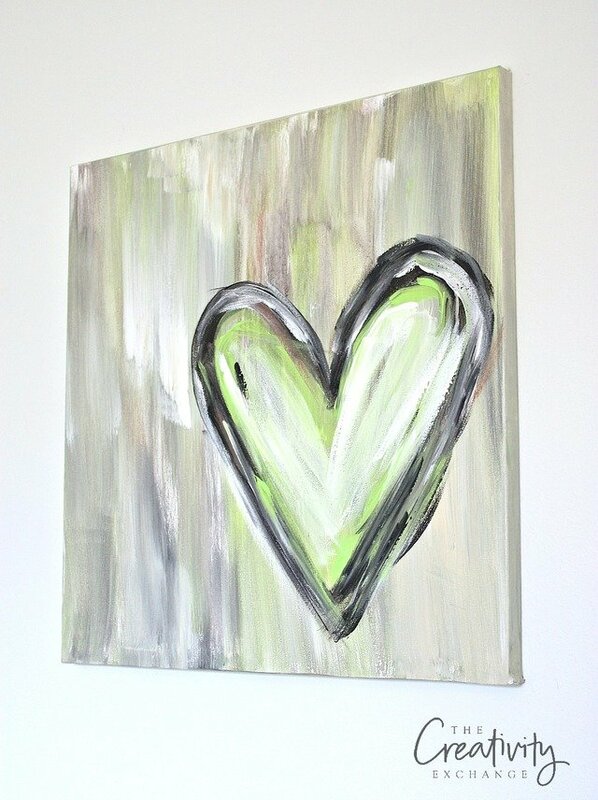 You can make it abstract by just swiping paint onto the canvas without blending, or you can blend if you like. You can see below, I just started layering more swipes of all color. 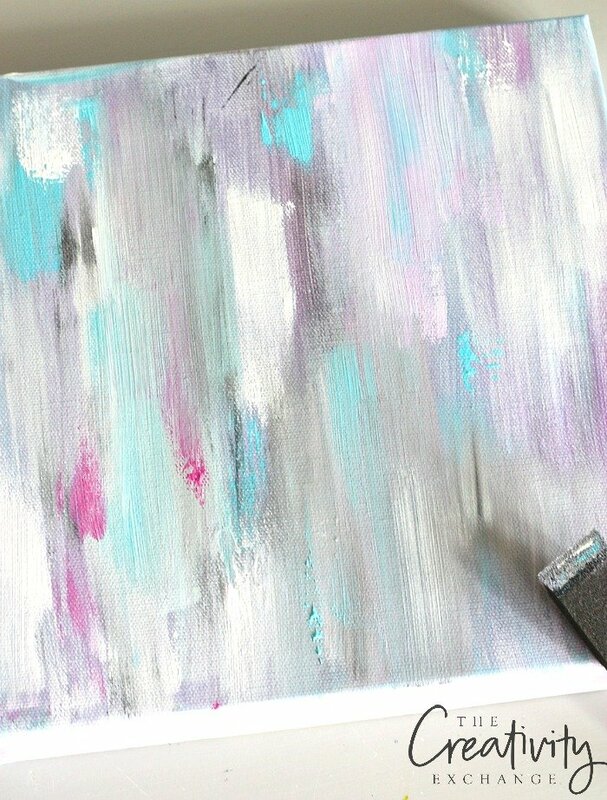 I’m going for a more abstract look but if you want your canvas more blended, work a little water into your brushing. When you get your base to where you want it, dry your canvas again with a hair dryer or wait a couple hours until your canvas dries. If you’re still not where you want to be on your base, you can always come back and add more tweaks when the painting and heart are done. Sometimes that is a great way to better help you see what your painting needs. 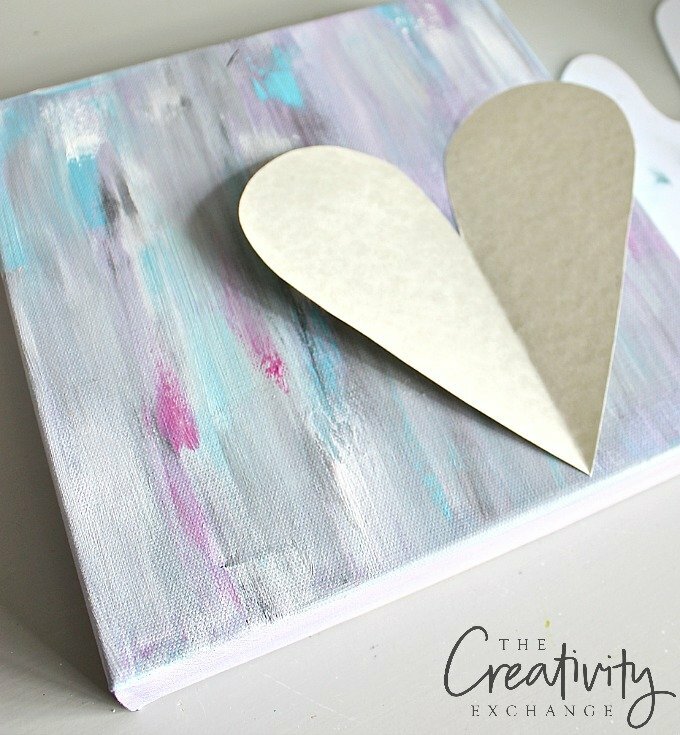 Next, cut out a heart the size that you want either on poster board (for larger canvases) or card stock for smaller sizes- to use to trace on a heart. 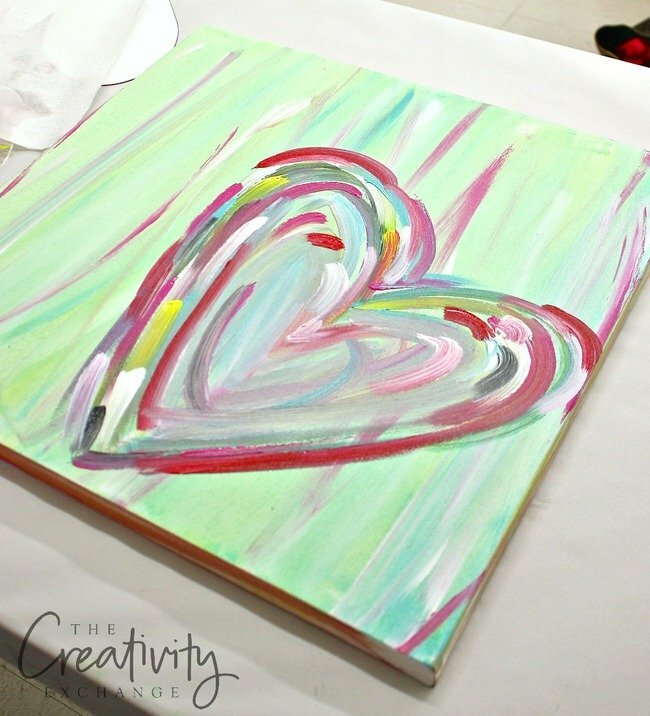 You can do a long and whimsical heart, or a traditional heart and you can place it anywhere you would like on your canvas (lots of possibilities). 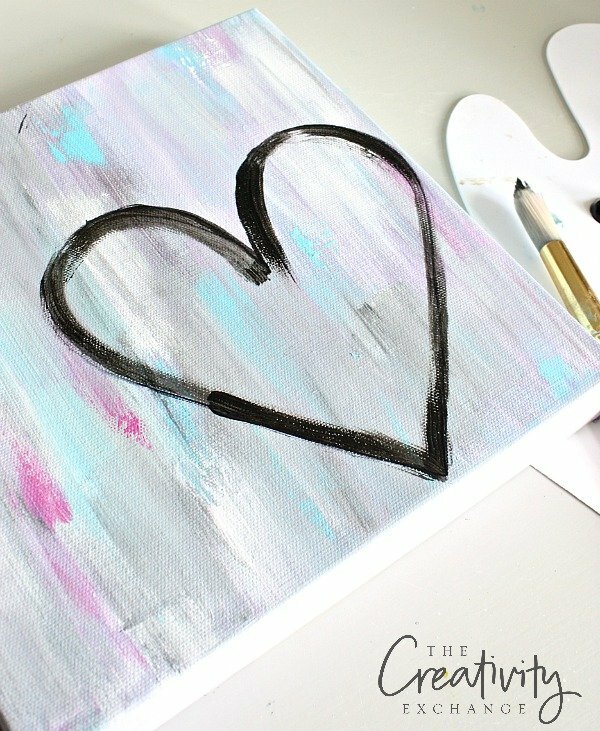 Trace your heart with a black sharpie- don’t worry, you will be covering up the marker with paint. 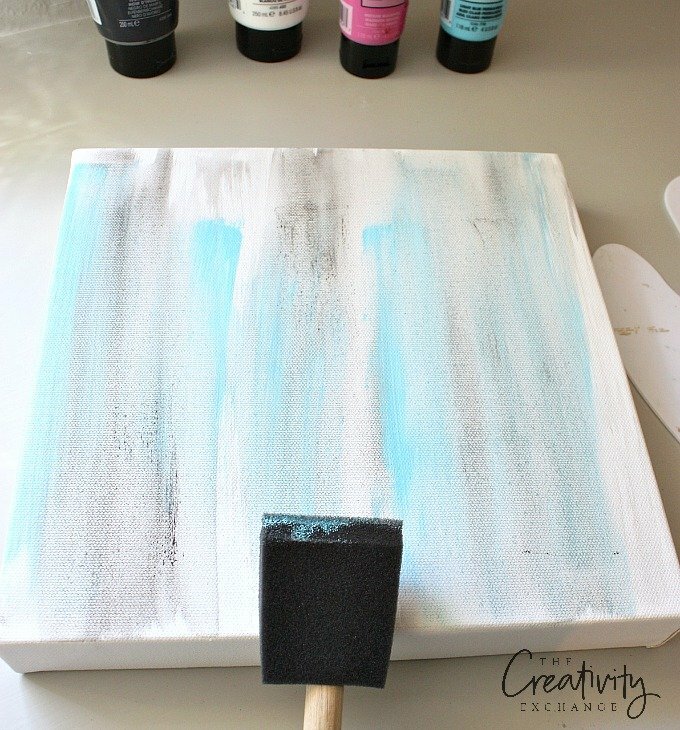 Your canvas needs to be completely dry for the sharpie to show up. 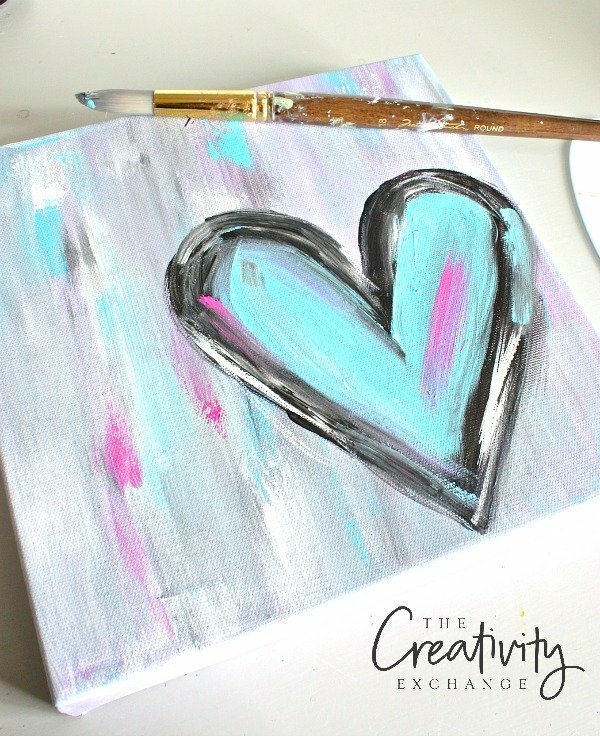 The last step is to lightly swipe white lightly around your heart and add in hints of your other colors. When I say swipe, that means to lightly swipe just a tad of paint with the top of your round brush. You will NOT want to do full pressure of the whole brush. Don’t panic here! You can’t mess this up, trust me! If you get too much of a color, go back over and swipe it with your main color. For instance, adding white to the edge of my black heart really added contrast but if I swiped too much white, I went over it with black. It’s also fun to blend just a little too (I did that along the outer rim of the heart with black and white to get a little gray). Ok, so are you gonna try this? It’s so fun and I hope you do! You can so do it! Cyndy, I love this post – thank you for sharing your techniques! The hair dryer – who knew? Not me. 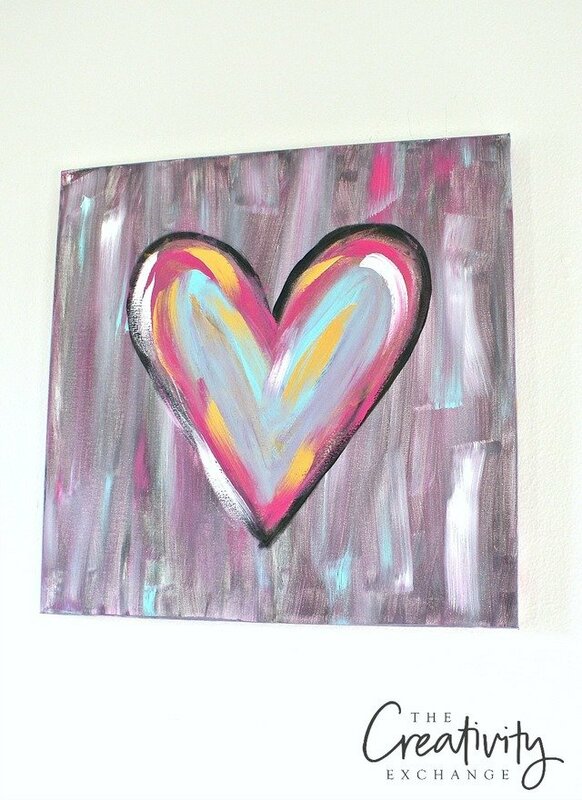 Your paint party sounds like a ton of fun and the heart art is so cute. Thanks Karen! This was a very fun (and easy) group project to do and the ladies just loved it but still had plenty of time to gab and catch up. Keep me posted if you guys decide to do it and send me a pic 🙂 Thanks for your note! 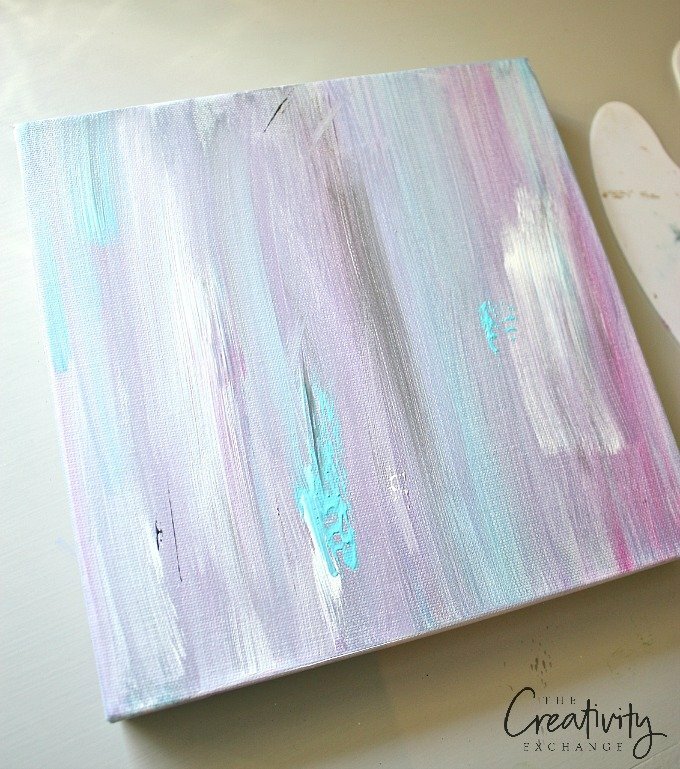 I picked up a couple of canvases at my local Goodwill and your or step by step techniques will let me get started on something with them! The hearts are so cute! Thanks! This is so cute! I’m anxious to try this and give to my 16 year old daughter! Did you paint the name (If so what brush did you use) or did you use some type of permanent marker? Love these! Going to have a group of ladies do this! 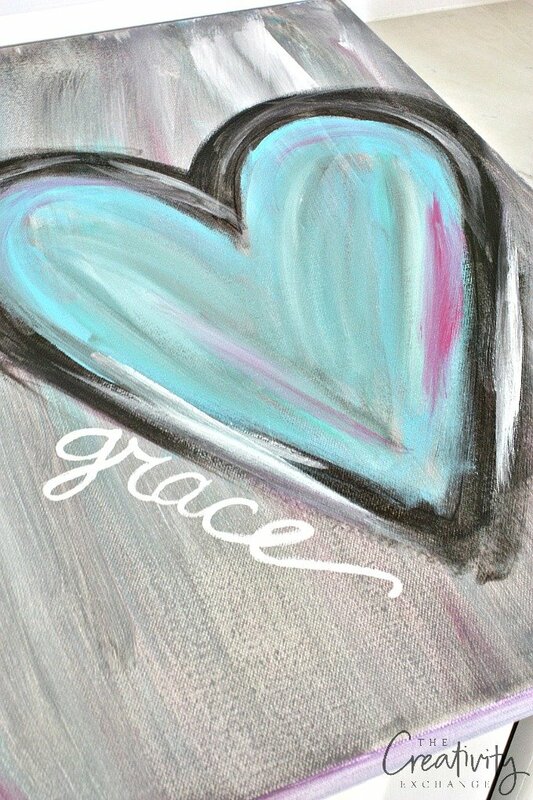 What did you use to do the writing of words “love”, “grace”? Thank you for this posting! 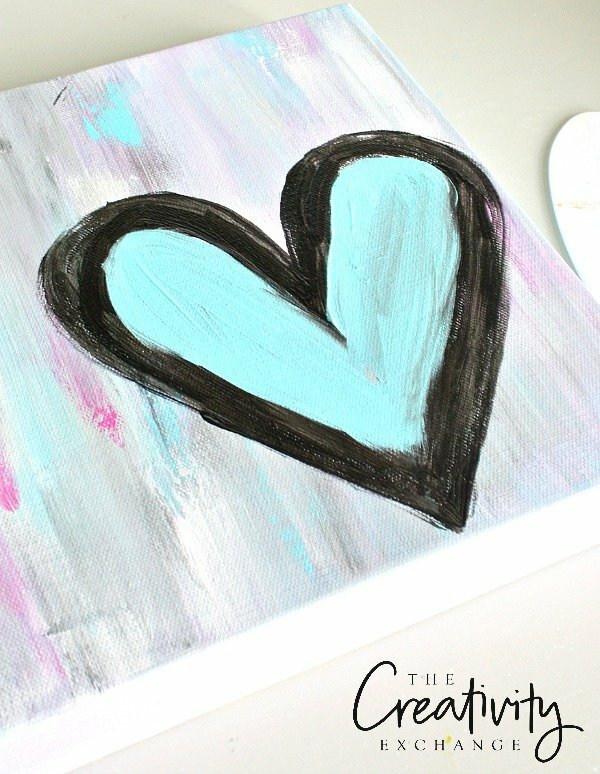 I’ve been looking for some canvas art projects to do at home and your direction was perfect! I have several latex wall paints left over and wondered if they would work. What do you think? 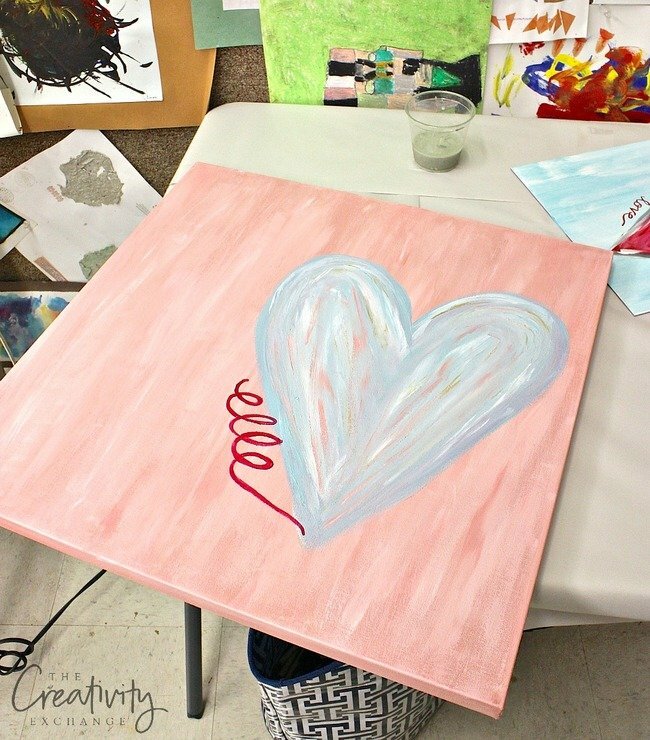 I have 75 minutes to do a project with a group of teen girls… do you think this would be doable? Would be a fantastic project to do with teen girls! Our big group did it in about the same amount of time. Have fun! Thanks for detailed information.Can big broad brushes give the same effect as the sponge brush? Thank you for the detailed steps and pictures of your tutorial. I don’t leave many comments however this deserves a high five. I’m trying to get out of my comfort zone in regards to what I usually create . ( I am just so critical of myself ) Thanks again. Great to see all the different art work you inspired! Really appreciated your step by step tutorial along with pictures. Hoping you will continue to post more!! Thanks again.